Score and Parts. By The Canadian Brass. By Antonio Vivaldi (1678-1741) and Johann Sebastian Bach (1685-1750). Arranged by David Baldwin. Brass Ensemble. Concerto, Baroque, Classical, Quintet. Full Score and Parts. 8 pages. Published by Hal Leonard (HL.50396710). 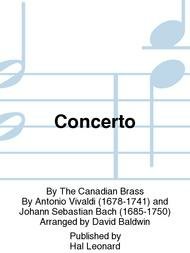 Originally by Antonio Vivaldi, first arranged by Johann Sebastian Bach. This engaging work of the Baroque era is reinterpreted here for the modern brass quintet by David Baldwin.